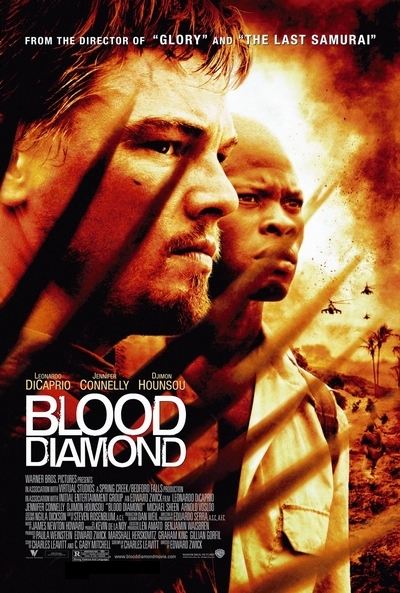 Story: Set against the backdrop of the chaos and civil war that enveloped 1990s Sierra Leone, "Blood Diamond" is the story of Danny Archer (Leonardo DiCaprio), an ex-mercenary from Zimbabwe, and Solomon Vandy (Djimon Hounsou), a Mende fisherman. Both men are African, but their histories and their circumstances are as different as any can be until their fates become joined in a common quest to recover a rare pink diamond, the kind of stone that can transform a life ... or end it. Archer, who has made his living trading diamonds for arms, learns of Solomon's hidden stone while in prison for smuggling. He knows a diamond like this is a once-in-a-lifetime find - valuable enough to be his ticket out of Africa and away from the cycle of violence and corruption in which he has been a willing player.